Time to tackle more of the interior finishing. 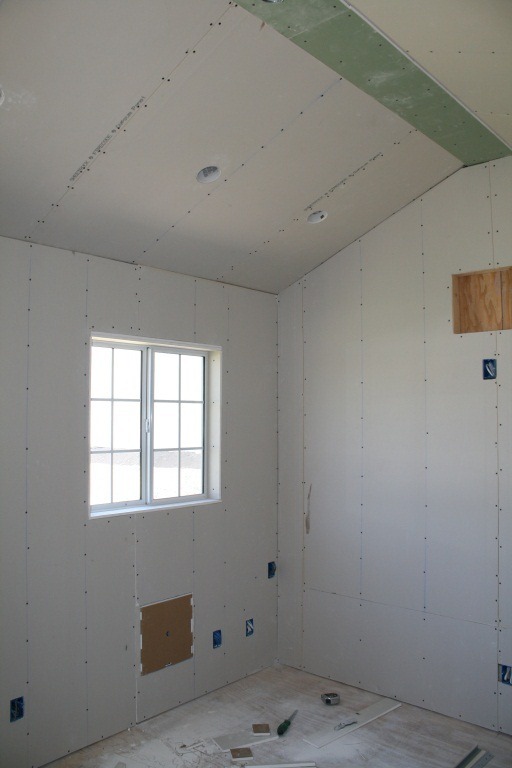 Putting up drywall isn’t super difficult, but it is time consuming and a bit back-breaking when you are muscling the pieces in place by yourself. The main idea is to have as few seams as possible, so planning and careful measuring are in order. I put up the ceiling pieces first using 5/8” drywall which is a little sturdier for the ceiling, but is also quite heavy. Luckily the shape of the ceiling dictated smaller pieces (as you can see in the photo). Holding a large piece of drywall up to the ceiling with one hand and trying to screw it in with an electric drill in the other, while balanced on a ladder, is a definite recipe for disaster. So, before you even attempt to put up your first piece, you should take a little time to build a couple of “T” helpers. A “T” helper is simply a 2”x4” stud (slightly longer than the ceiling is high), with a 3’ (or so) piece of a 2”x4” attached to one end (the shape of a “T”). With a pair of these, you can position the piece of drywall on the ceiling and wedge a “T” under it, to hold it in place while you screw it to the studs. In my case I used two of them (one short and one extra-long, due to the vault in the ceiling) to snugly hold the sheet of drywall to the angled ceiling. It was fairly easy (but exhausting) to position the “T” helpers off to either side of the area I was working on, climb the ladder with the drywall, position it on the ceiling, hold it in place with one arm, while grabbing and wedging in the “two “T”s. It’d be much easier to have another person to assist, but it is definitely doable by yourself. 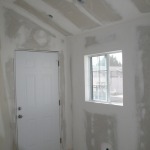 Once the ceiling pieces were in place, 1/2” drywall was used on the walls. 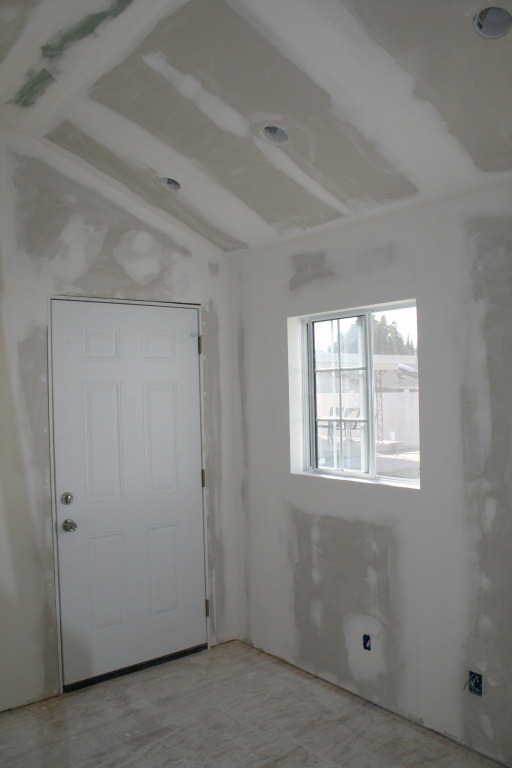 By putting the ceiling pieces up first, the edges of the ceiling pieces are also supported by the drywall on the walls. It just makes it a little sturdier. Get all of the right tools – a drywall “T” square, good utility knife with plenty of blades (they dull very quickly), a dimpler attachment for your drill (this allows you to drive the screws the exact depth each time), the correct screws depending on whether you are joining to wood or metal studs (I had both which required different screws for each), and a RotoZip (if you can afford it). Search the internet for tutorials and videos on putting up drywall and go over them a few times before you start. It really does help. 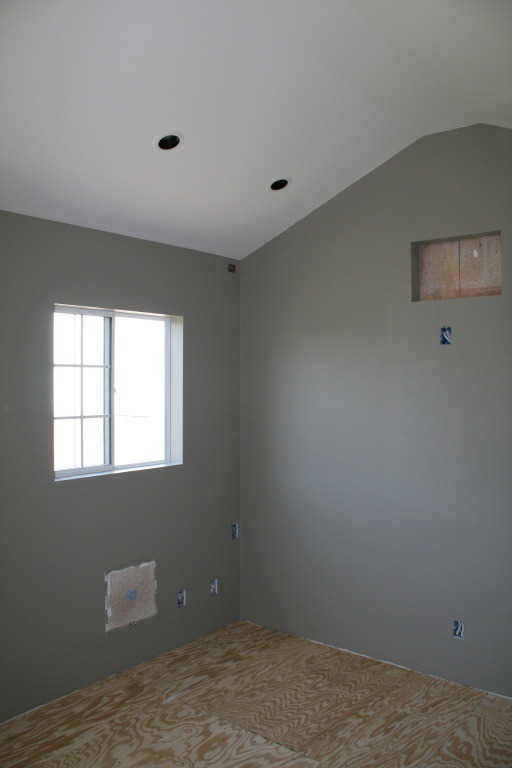 Mark the locations of the studs on the floor and ceiling before you put up drywall on the walls. Once you have the piece of drywall in place (with a couple of screws), snap a chalk line (light blue works best) across the face of the drywall at the location of each stud. This makes driving the screws in the correct place much easier. 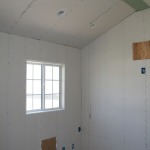 Now that all of the drywall is in place, the key process to ensure that the room will look good once it is painted is taping / mudding the joints, seams, screw holes, and other imperfections. This is a fairly time intensive process (to get it done correctly that is), so I enlisted the expertise of my father who has done this a million times. He definitely knows all of the tricks and techniques to get the job done quickly and more importantly…correctly. For this step, I would say to try it yourself if you have plenty of time and the desire to learn from plenty of mistakes. I didn’t have the patience for it, but luckily it only cost me a few meals. If I didn’t know anyone, I probably would have hired this piece of the job out to a pro. I did learn quite a bit about the process, and will probably tackle it myself the next time a project like this comes up (hopefully, not any time soon). Once all of the mud had dried and had been sanded smooth, my father also loaded up a texture gun with a special mixture of drywall mud, and shot a nice medium texture all over the walls and ceiling. 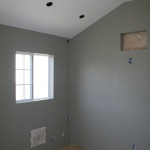 Texturing the drywall really adds a professional touch and makes the paint job look much nicer. Down to the home stretch. 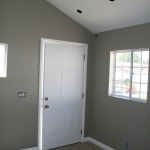 Painted the walls a nice olive green color and the ceiling a cool white. Finished off the recessed lighting with some trim bezels (be aware that the bezels are sort of pricey compared to the cost of the fixtures themselves. I went for the least expensive ones I could find at around $13 each, but they went as high as $45 each…ouch). I also decided to add an extra 1/2” layer of plywood on the floor to stiffen it up a bit more and add a bit more sound deadening. There was plenty of space (especially at the door) to do this without affecting the carpet installation. For the flooring, I chose a thin-ish berber type carpeting with just a felt pad underneath. Since I was going to be using this for an office, I didn’t really need much cushioning, plus it would interfere with rolling an chair around. I considered some kind of laminate (simulated hardwood) flooring, but really wanted to deaden the sound a bit more. I also researched some self stick carpeted floor tiles, thinking that I would be able to do the install myself. Most of these options were ugly to say the least, and the ones that looked decent were more expensive than carpet (including the install). So, this piece of the job was hired out to a local carpet store and they did a great job. 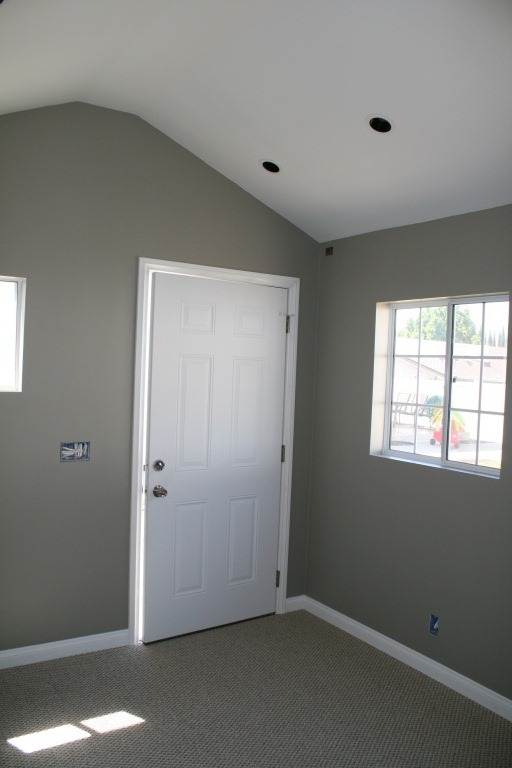 I also installed trim around the door and baseboards (painted the same color as the ceiling, but in a semi-gloss instead of matte finish) to really give the room a finished appearance. The next article will go into details on running the power and data lines from the house to the office, as well as the finish wiring on the inside. this is exactly what we’re looking to do. Any possibility of the promised part IV? Running the phone and data lines from the house to the office is our stumbling block! Yeah, that part of the project is still “in work”. I have the power installed out to the office and the internal wiring has been completed. What needs to happen next is to completely rewire the main house for network/video. This will allow me to run everything from a central point in the house (or garage to be more precise). Once that is done, I just have to pull a set of wires from the central point, under the house and through the PVC pipe laid in a trench out to the office (see the link for more pictures above). Looks fantastic! I’m currently awaiting delivery of a ‘Shire Dean’ log cabin which I’m converting into an office (unfortunately we dont get Tough Sheds in the UK).